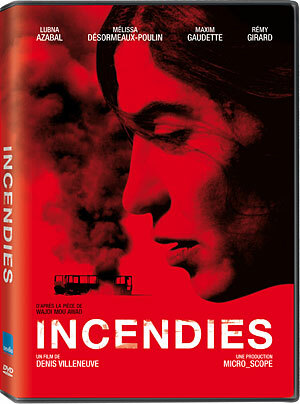 eOne released Incendies on DVD and Blu-ray in Canada on September 13, 2011. Help support Toronto Screen Shots by buying it on Amazon.ca. Incendies (Director: Denis Villeneuve): Surely the best Canadian film of last year, and deservedly nominated for an Academy Award®, Incendies tells an epic and yet personal story of war, divided families, and devastating secrets. When their mother dies suddenly, twins Simon and Jeanne are shocked that her will assigns them the task of returning to their Middle Eastern homeland to deliver two letters, one to the father they thought was dead, and one to a brother they never knew they had. Though the country is never referred to by name, it’s almost certainly Lebanon, which suffered through a bitter civil war that raged from 1975 until 1990. The film flashes back and forth between the present (the twins’ quest to find their missing relatives) and the past (their mother Nawal’s long and surprising journey from her homeland to Canada), and through the masterful editing, we discover some shocking family secrets at precisely the same time as Simon and Jeanne, even though we’ve been following Nawal’s story too. It’s an impressive feat, and just one of many in this superb and moving film. This entry was posted in DVD and tagged war. Bookmark the permalink.